Creating an interior that is both sophisticated and highly contemporary becomes a straightforward task when you have the right inspiration. Here at Spaceist, we work on a range of projects that require an individual approach, each one presenting a set of challenges. 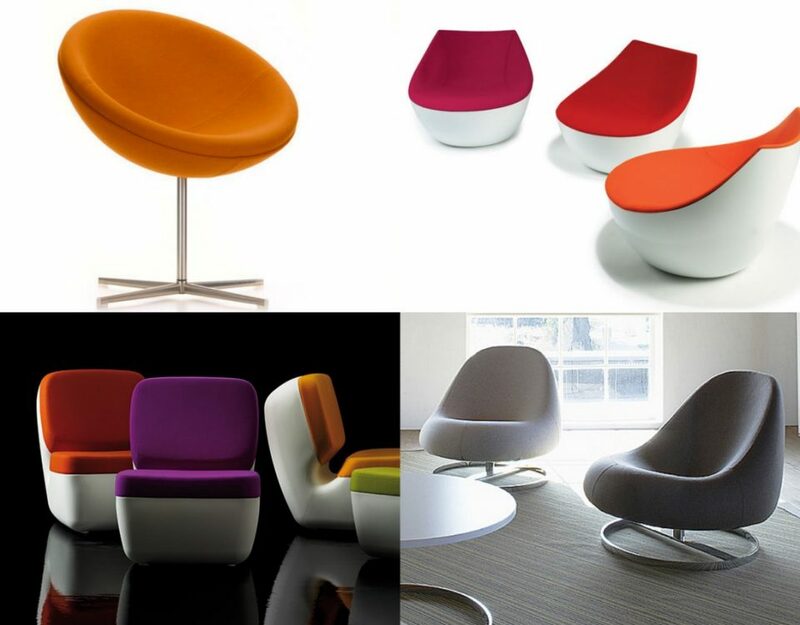 Creating a space that is multifunctioning, aesthetically pleasing and highly robust. Using a selection of products from our website, we have taken some inspiring interiors and presented ideas on how they can be recreated. 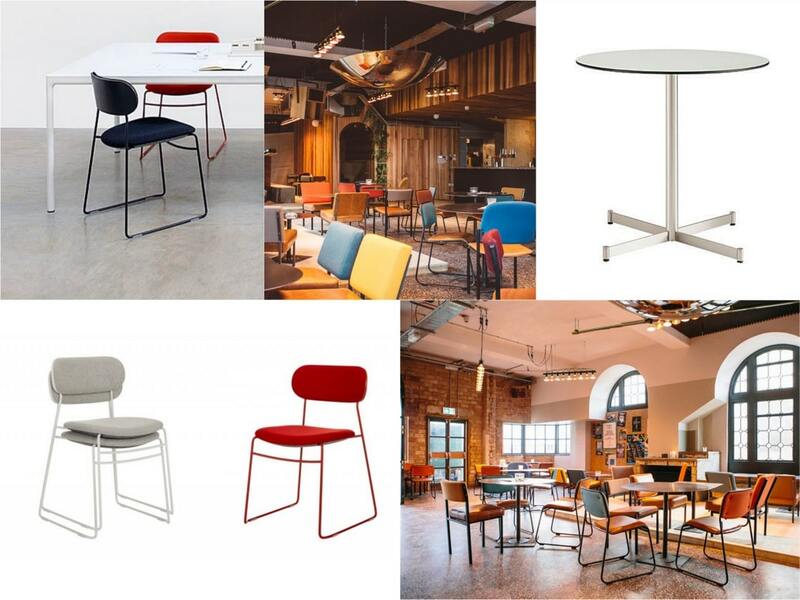 From distinctive designer seating to modest café tables, working with a mixture of projects is made simple with the wide selection of furniture product ranges we supply. Striking polished grey floors have been complemented with a selection of bold, dark furniture options at this French restaurant and bar, based within a former Stockholm Tax office. Presenting both a bar area and a larger dining space, the various areas come together through a uniform colour palette. 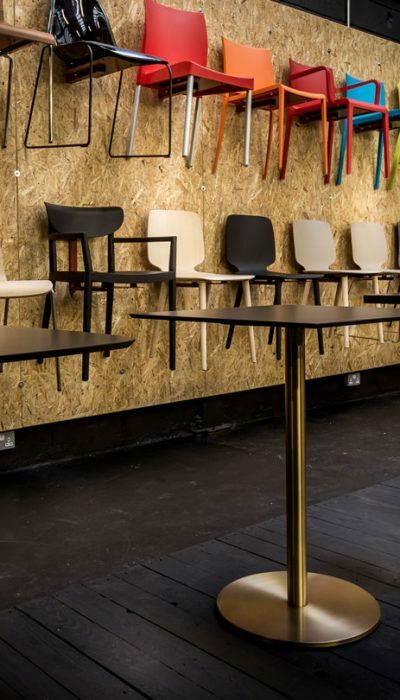 From formal wooden café chairs to modest and casual high bar stools, these quintessential elements appear bolder against the sophisticated grey and silver hues of the Usine restaurant interiors. Recreate a sophisticated look with the use of classical furnishing options. To create a bold look, we have chosen the distinctive Nemea wood chair. Manufactured from ash wood, the smooth frame is supported by a die-cast aluminium frame that sits under the seat. 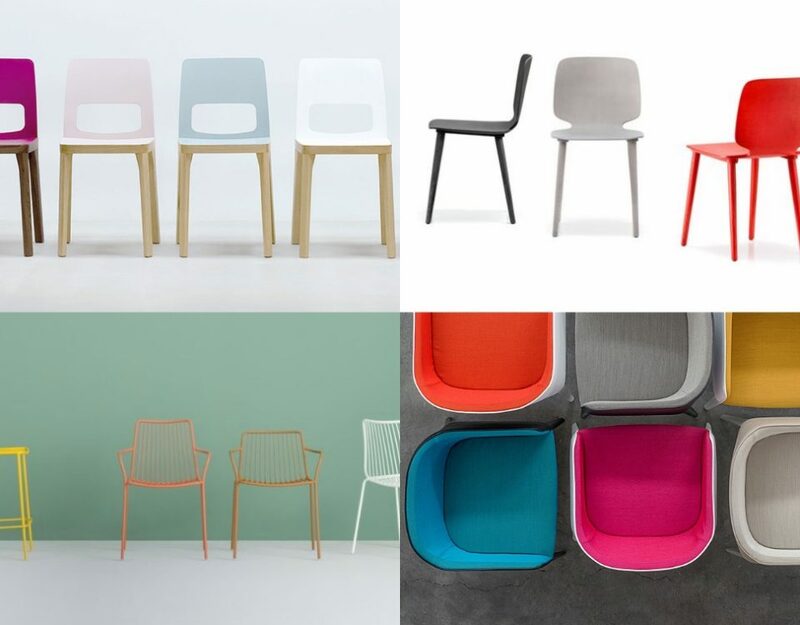 The key characteristic is the shapely backrest functions as a table rest and further increases the designer appeal of the Nemea chair. 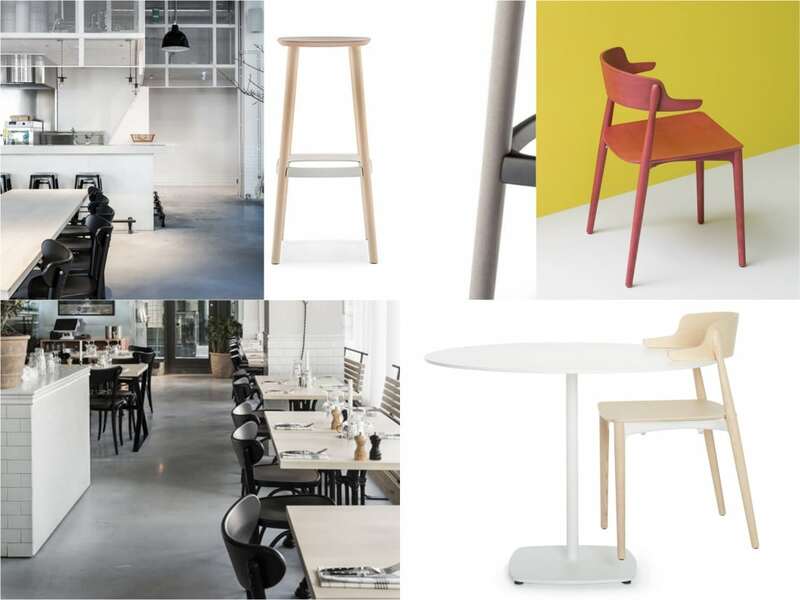 To add seating variations within a slick and high designer style restaurant, the Babila wood stool presents both a practical and modern variation. The up to date look of this classical stool is due to the combination of solid wood and an aluminium footrest. A fun and bright space, the Kids Museum of Glass is a vibrant and colourful environment where children can independently explore the various glass installations and learning experiences. As the museum is aimed at young children, it is vital there is some accommodation for the adults accompanying them. 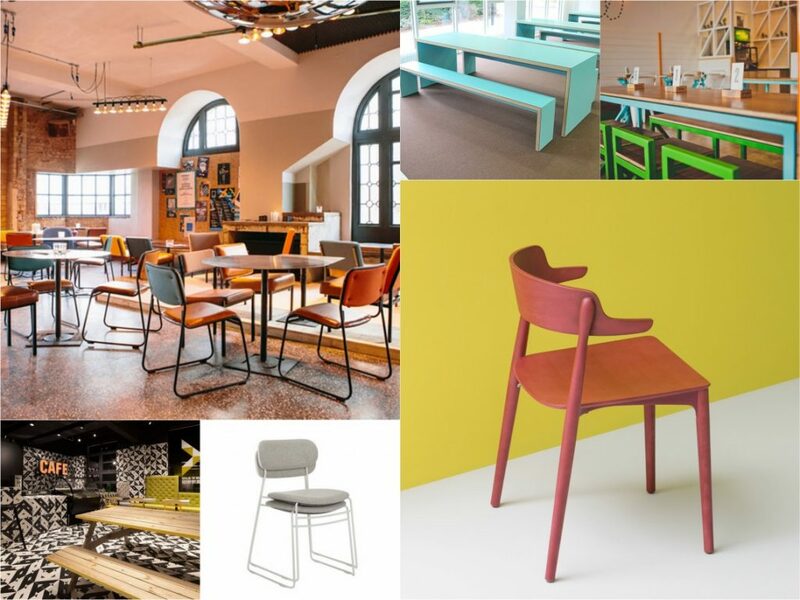 Therefore, the café space presents an area where both young children and their parents can relax and enjoy a refreshment or snack, within the vibrant and bold atmosphere presented throughout the museum. The style of seating used at the Kids Museum of Glass is both playful yet comfortable enough for both young children and adults. Recreate a fun look with the Marina picnic table. The picnic table is made out of pultrusion fibre-glass profiles and can be supplied in multiple colours and features the classical form of a wooden picnic table with a modern twist. 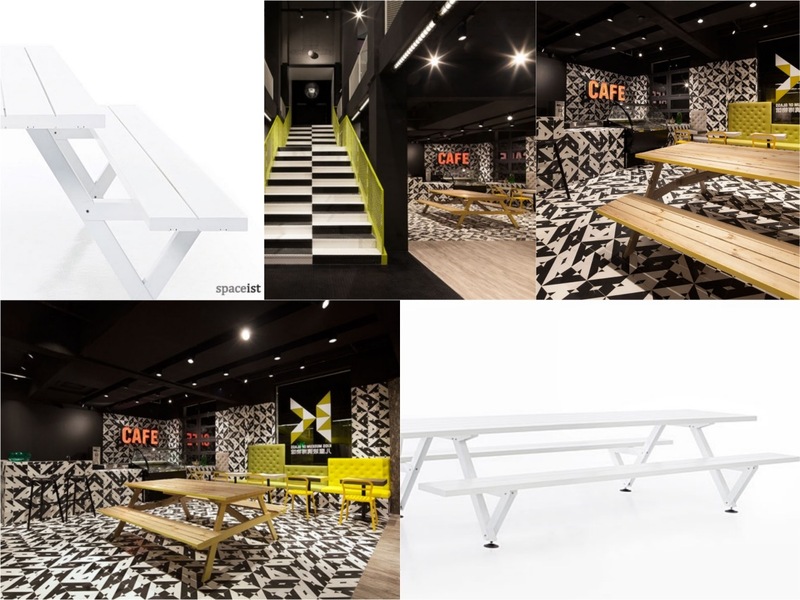 A fast-food outlet that brings together two cuisines, the practical yet playful interiors of this barbeque restaurant present an edgy feel with a mixture of wood and metal furnishings. Taking inspiration from food on the menu, bright colours have been used throughout the furnishings to enhance the warm feel. 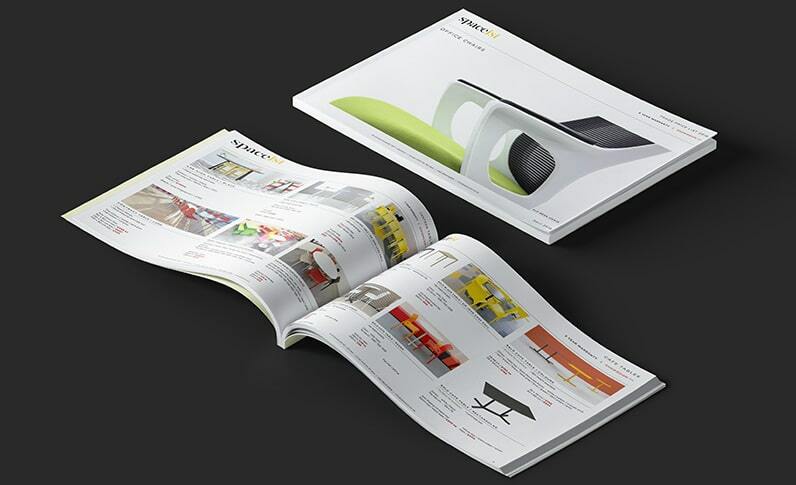 The minimal bench options add a sufficient option for seating whilst making optimal use of space. A space that requires lightweight and agile furnishings that are also highly contemporary, the JB Waldo 45 bench is an ideal fit. 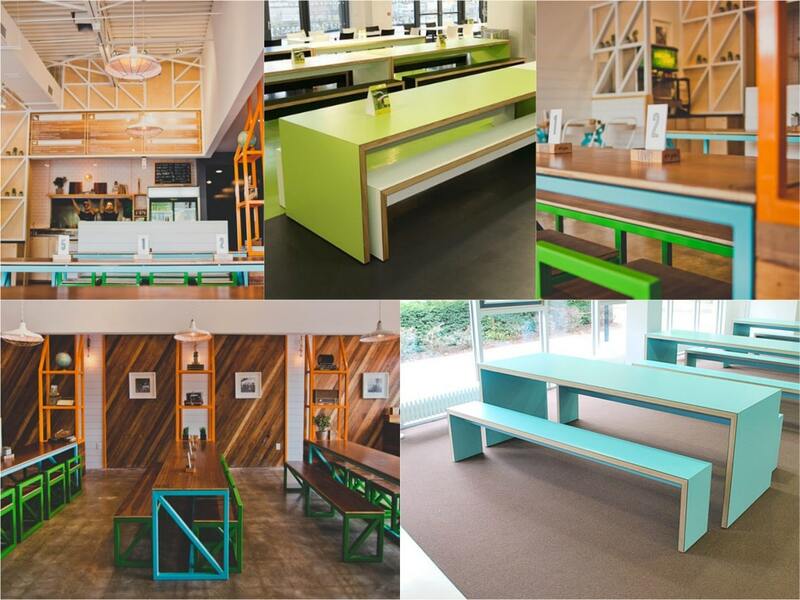 The benches present an ideal option for busy and fast-paced spaces that require robust furniture solutions whilst the colour options means it is possible to mix and match colours to create a vibrant interior palette, such as the interiors at Chi’Lantro. Patterns, formerly known as Audio and Escape, is well known for playing host to a line of live-music performances from groups like Daft Punk and The Chemical Bothers. The Art-deco renovation includes a selection of charming seating options to enhance the casual interior atmosphere. The wooden features add warmth whilst the selection of wood and leather creates an environment that works just as well throughout the day as it does in the evening and late into the night. 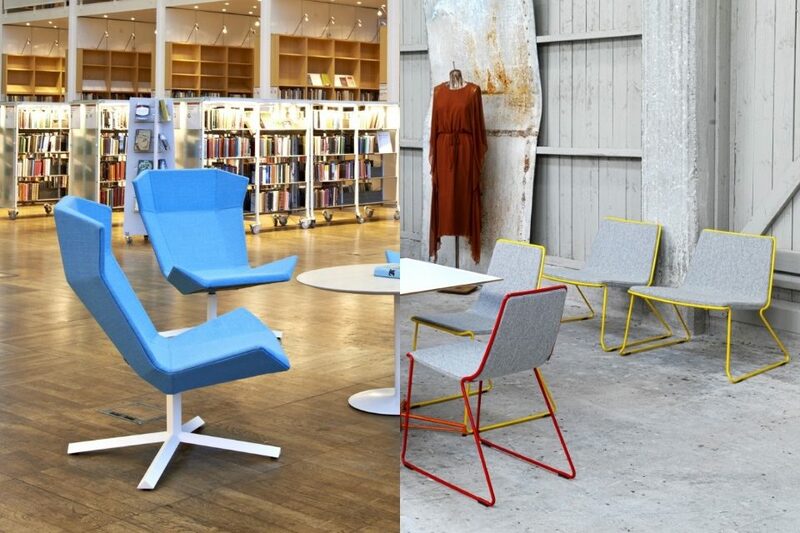 Create a casual space for a multifunctional interior with the PLC chair, manufactured in the UK. Made from highly durable powder-coated steel, the frame is available in a range of colours. 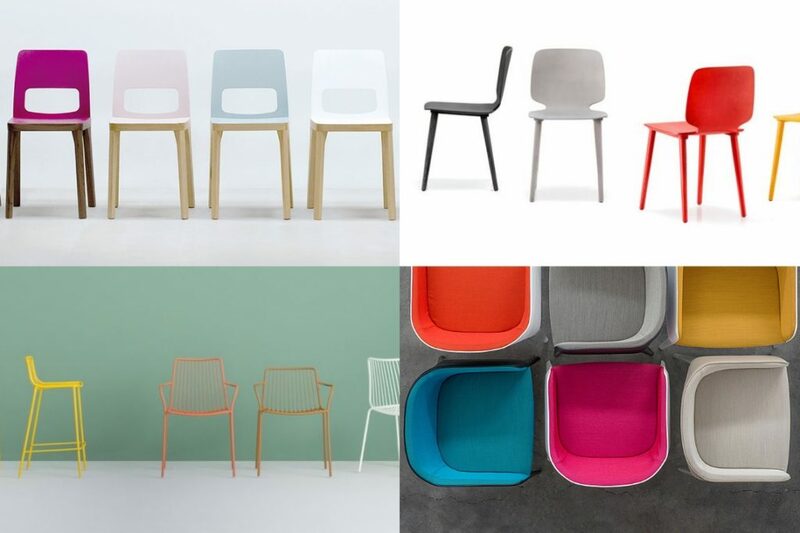 The design of the seat and backrest includes a composition of coloured or oak veneer plywood that also comes with upholstery options. The fabric comes in over 60 colours making it possible to mix and match a variety of shades to create a decorative interior palette. Composed of a brushed steel base, the Zenith round table makes an ideal option for restaurant and bar spaces. Both lightweight, yet highly durable, the slimline table top adds a minimalist look and comes in a variation of laminate or veneer finishes. 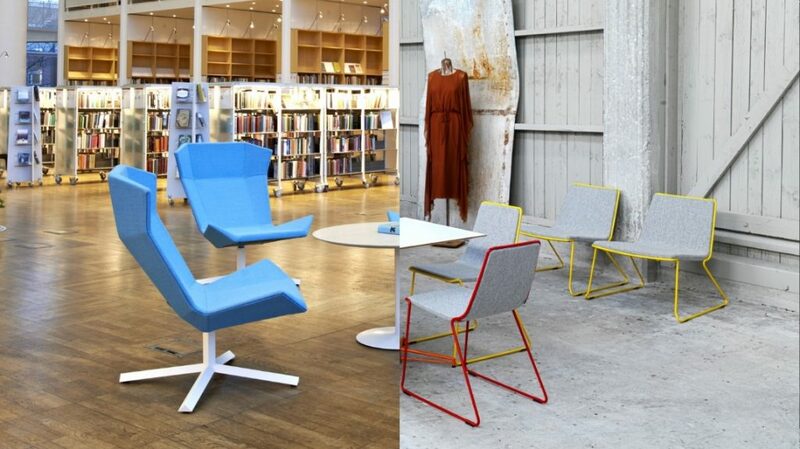 It is a practical option to match with the PLC chair and create a space for multifunction.